,,,say it ain’t so!!! I just installed AC in my house!!! Boy, those solar panels up in Truckee really have helped prevent global warming. Can’t argue with the results. Now, take it easy up there in the high elevation country and don’t overdo it. Moderation is the key. Moderation, please, moderation before we all look like those bugs in plastic ice cubes I used to like to serve guests when they asked for a refreshing beverage on fine summer’s day. It’s true, tis true. We might all be dead in 12 years, if we don’t freeze our tushes off first. I would like an additional couple of degrees rather than a mile thick ice cap. At the Next Grand Minimum there are some post on the coming cooling that have generated some positive comments. The gist of the matter is that all three main cycles are entering minimum phase, beginning with the end of this current solar cycle (Cycle 24). Cycle 25 will be even lower than 24, with 26 being very nearly flat-lined. Cycle 27 will begin to show a few signs of life, then there will be a gradual rise to full activity over several more solar cycles, even as the last three cycles have slowly decreased in levels. This means that the bottom of the extended, or ‘Grand’ minimum (to use Zharkova’s terminology), should run from ~2020 to ~2053. While you are visiting the Next Grand Minimum look around and you will find more evidece to support the science supporting a cooler future. 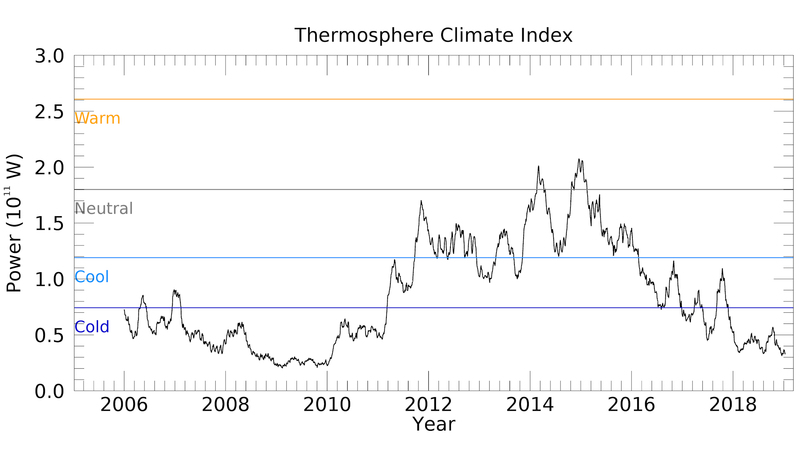 I've been glancing at the Thermosphere Climate Index reports at spaceweather.com for awhile, I thought sure I'd mentioned it here, perhaps last November. The Mlynczak quote should probably be viewed with a more limited intent than you've implied here... it will be a record cold of the TCI for the space age... when it gets to where it was in 2009, or maybe 1954. Not an ice age for the surface. Patience, dear friends. It will be awhile before the Zharkova prediction of a little ice age becomes indisputedly noted in our weather, assuming her two and four axis solar models bear out.
" To emphasize, the cooling effects we are seeing in Earth’s thermosphere are a result of the current solar minimum conditions. The thermosphere is the layer of Earth’s atmosphere beginning 65 miles above Earth’s surface and is highly sensitive to solar activity. There is no relationship between the natural cycle of cooling and warming in the thermosphere and the weather/climate at Earth’s surface. NASA and other climate researchers continue to see a warming trend in the troposphere, the layer of atmosphere closest to Earth’s surface. There is no inconsistency between the science findings of a warming troposphere [where we live] and the Thermosphere Climate Index described above in the Space Weather article." I just assume that the next ice age will be dangerously warm. More research dollars are needed. Steven - I too noticed the sleight of hand with cherry picking of Mlynczak's words. I've also heard that the compressing of the troposphere can lead to warming. . . but admittedly I can't source that reflection so I won't treat it as fact, as some others might. Scenes, your observation is more apt than Frisch's who is stuck on the bright shiny object in Mlynczak's statement walking back some of the more excitable conclusions on the skeptic side of the aisle. It was Svensmark's Cosmoclimatology paper in 2007 that pushed me down the skeptical rabbit hole, and it has gone from being pie in the sky to settled science, all but for the shouting. It is true... the warmistas at NASA-GISS do continue to see a warming in the troposphere, and they will... until they see a cooling that they cannot ignore. That is not yet. Record lows back East.. I'm sure the true believers just call it "weather". So........ How is that "Snow will be a thing of the past, children will only read about in history books..." work'n for ya'? Ya' gotta laugh at the true believers. Climate has been changing since this rock started spinning, yet somehow they think they can keep it just the way they want it. And if they can't, they need someone to blame. ,,,,,,oh dear,,,is George doing a variation of Chicken Little,,,the thermosphere is cooling, the thermosphere is cooling!!!??? Don't be so sure there is NO connection between the thermosphere index and troposphere temps. There is. Cannot help noticing that those of us with the STEM educations are unanimous that the world is warming, for the good, and we should be grateful for that. The last ice age saw CO2 concentrations drop dangerously low to the point where photosynthesis stops. Equals end of life. Virtually all scientists agree that there will be another ice age in our future- indeed, the Earth has been cooling since it formed (slowed only by internal radioactivity) and will be a frozen clinker eons before the Sun goes Betelgeuse. The Holocene began ca. 14kya, the Holocene 'optimum' was about 8kya, about the time humans began keeping records. The Minoan warm, Roman warm and Medieval warm periods were about 3, 2, and 1kya. The modern warm is now, and we don't know if it has peaked yet. Each of the last warm periods has been a little cooler than its predecessor, as logic would suggest in a descent to the next ice age. If that pattern holds, we probably have about attained the modern warm max, tho there is no certainty. The current warming has manifest itself mostly in the Arctic and in increased nighttime temperatures. What's not to like about either of those things? Until Greenland is self-sustaining again, we haven't reached the level of the Medieval warm period. Good marker to look for. If you don't believe it, try rowing across the North Atlantic in a 40' open boat with your mates. I think it's fair to say that humans have put their stamp on the environment worldwide and it'll likely show up clearly in the fossil record. To what degree climate is driven by people vs. external influences is something I'll avoid 'believing' in until predictive ability improves a bit. The thing I'm tired of is how 'global warming' (now 'climate change') somehow always involves womens rights, whatever that means anymore, free college, and free healthcare paid for by the rich. A serious look at it, or any other ecological pressure, would center around population numbers generally, mass movement from the Third to the First world, and China. This last country now appears to be temporarily 'our' BFF since they are fighting with Orange Hitler. Want to save the world? Carpet bomb Africa with condoms. That's where the real disaster is going to happen. BillT: "Boy, those solar panels up in Truckee really have helped prevent global warming." It's a strange ol' world, isn't it. Now I get to listen to cell phone expert Ms. Reinette on the radio. Heaven help us all. Someone didn't get the memo. OR maybe trying the same line of crap twice,, no one will notice? A dramatic decline in the Sierra Nevada snowpack will be felt the most in Northern California by mid century, according to a study published in December 2018 by the Department of Energy's Lawrence Berkeley National Laboratory (Berkeley Lab)." Here we go again with "Snow will be a thing of the past!!!!!" Yup, that "prediction" came back to bite.